The calendar might still say November, but there is tinsel in the shop windows and holiday music on the radio. . . which means the end of Fall semester is just around the corner! The CETCI team knows you’ve got lots of lists to make this time of year, and though it can’t shorten your gift list or tell who’s been naughty or nice, this End of Semester Checklist can help you wrap up the semester and get set for Spring. If there are other ways we can help you wrap up the term, don’t hesitate to email (edtech@pacificu.edu) or give us a call. *Click on links to access detailed tutorials for each topic. Add a Column in the Gradebook for any graded work that students did not submit electronically through a Moodle assignment or activity. Helpful Hint: you can use the Perform Bulk Insert option to quickly enter grades if most students earned the same number of points (like for a group presentation or bulk participation score). If you want to save course grades as an Excel or Google Sheets file, you can easily export grades into a spread sheet. 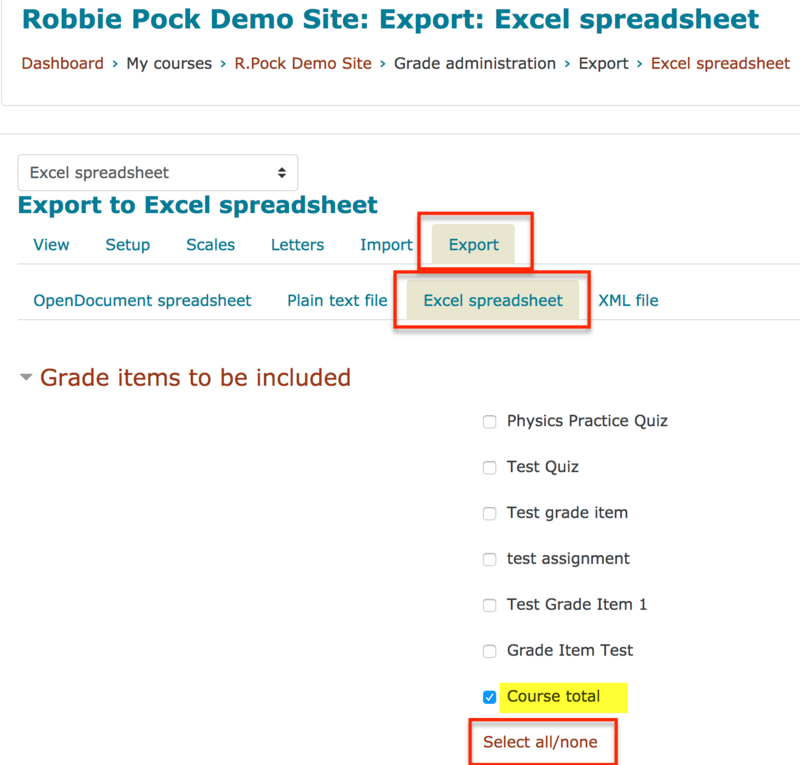 Remember that you can select which grade items to export–if you only need final grades, you can deselect all items in the “Grade items to be included” section (click “select all/none”), and then just select “Course Total”. A good housekeeping practice is to backup and archive your Moodle course at the end of each semester. It only takes a few minutes, but allows you to save all student work and grades submitted to the Moodle course, as well as your course content. When UIS needs to delete old courses from the Moodle server, you will have a backup that you can restore to any course at any time. See Backing up your course to Box for a quick and easy tutorial. While you’re taking care of Moodle business, remember to link next term’s courses to Moodle. If the course content is the same, you can Import from the course you are wrapping up. Helpful to Know . . . . . . . . Note that students who were automatically enrolled by the Registrar (not manually enrolled) continue to have access to a course for 6 months after the course end date. Faculty who were automatically enrolled (not manually enrolled) continue to have access to a course for 2 years after the course end date. If you want to continue to have access to a course beyond 2 years, be sure to manually enroll yourself. For more information on course lifecycles see Technology Help Desk Moodle Policies. The CETCI team is here to help! Contact us at edtech@pacificu.edu or visit our site at http://www.lib.pacificu.edu/cetci/.